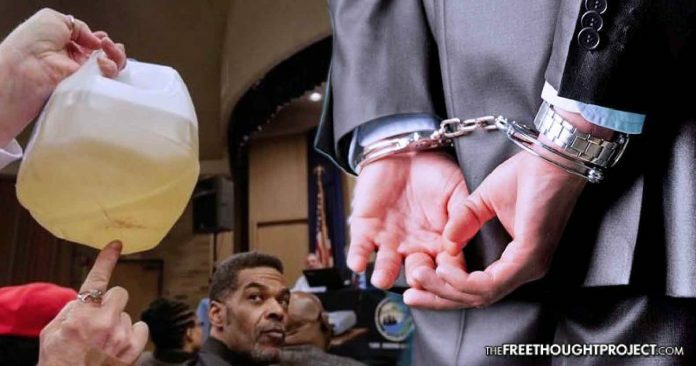 Flint, MI — (RT) Michigan’s attorney general has filed new, more serious charges of involuntary manslaughter against five officials in the Flint Water Crisis investigation, among them the head of Michigan’s health department. Heath chief Nick Lyon was charged with two felonies, involuntary manslaughter and misconduct in office, for failing to alert the public about an outbreak in Legionnaires’ disease in the Flint area, according to AP. Some experts linked the outbreak to poor water quality during the height of water crisis in 2014-15. Nearly 100 people were affected during the Legionnaires outbreak, 12 of whom died. “Mr. Lyon failed in his responsibility to protect the health and safety of the citizens of Flint,” Michigan Attorney General Bill Schuette told reporters on Wednesday about charges that are moving closer than ever to Governor Rick Snyder. Skidmore was a great-grandfather with three sons, four grandchildren and four great grandchildren. He died from Legionnaires’ disease in December 2015. Lyon’s was also charged for allegedly obstructing university researchers who are studying if the surge in cases was linked to the Flint River. Lyon admitted he was aware of the Legionnaires’ outbreak for months but wanted to wait until investigators in the state Health and Human Services Department had finished their own probe. Lyon, if convicted, could face up to 15 years in prison for the manslaughter and up to 5 years for the misconduct charge. Four others were charged with involuntary manslaughter: former Flint Emergency Manager Darnell Early; former City of Flint Water Department Manager Howard Croft; Michigan Department of Environment Quality’s Drinking Water Chief Laine Shekter-Smith; and Water Supervisor Steven Busch – all for failure to act in the Flint water crisis. Michigan’s medical executive chief, Eden Wells, was charged with a felony and misdemeanor for obstruction of justice and lying to a police officer and failing to protect the health and safety of the citizens of Flint. “During the course of the investigation, Ms Wells withheld funding for programs designed to help victims of the crisis and then lied to an investigator about a material fact,” Schuette said. Children have been exposed to lead. People in Flint have died as a result of decisions made by the individuals we are charging today. Michigan Governor, Rick Snyder, issued a statement after the felony charges were announced and said he is standing behind the two top health department officials. “Director Lyon and Dr. Wells have been and continue to be instrumental in Flint’s recovery,” Snyder said in a news release. “They have my full faith and confidence, and will remain on duty at DHHS,” according to Detroit Free Press. The problems began when the Flint’s water supply was switched to the Flint River in April 2014, while under state emergency management, but it was not treated to reduce corrosion. Lead from old plumbing leached into the water system, causing a massive lead contamination crisis. Schuette said that while no charges are planned against Governor Rick Snyder, his investigation would continue. “We have attempted to interview the governor [but] we were not successful,” Shuette said, according to Detroit Free Press. The Michigan attorney general said his office had also released an interim report on the investigation. His team had interviewed 250 people, examined over 100 emails and issued 51 criminal charges and charged 15 current or former government officials in the probe that began in 2016. Follow @tftproject on Twitter, Steemit, Minds, Instagram, and on YouTube.